In 1889, the Saltaire choir won £150 in prizes, and money from engagements was over £500. £350 was given to charity and the rest went to the Chapel Authorities. Over a five year period from 1889, they earned over £1,000. One of their most frequent appearances was at Hawes in the Hardraw Scar Brass Band and Choral Contest, set in a natural outdoor amphitheatre, but in 1891 they also performed at Regents Park, London, Morecambe, Middlesborough, and the Welsh National Eisteddfod in Swansea, as well as more local events in Yorkshire and Lancashire. 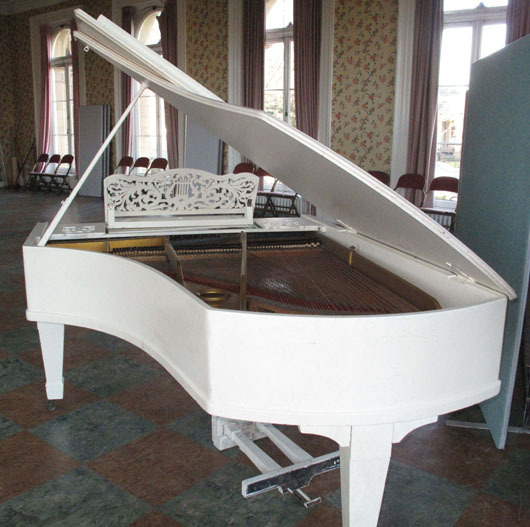 Their most enduring prize was the piano which is currently re-assembled in Victoria Hall. It has an inscription on a brass plate on the keyboard cover which reads: “First prize in the choral contest in the Second Annual International Music Traders’ Exhibition, Royal Agricultural Hall. 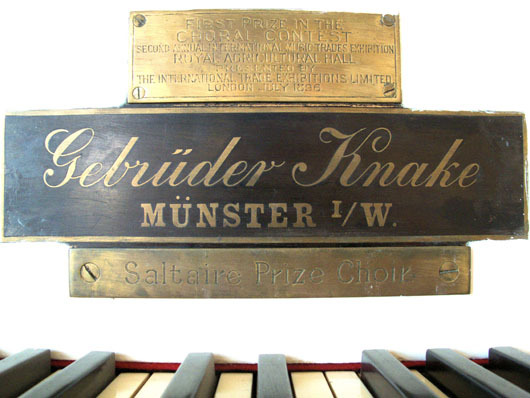 Presented by the International Trade Exhibitions Ltd, London, July, 1896.” This is a Gebruder Knake – Munster white grand piano. Photographs, courtesy and copyright of Ian Watson. David King has researched the details of this competition in the Huddersfield Chronicle of 21st July, 1896. He found that the piano was valued at 100 guineas. The choir was given a certificate and a gold medal was presented to their conductor, Mr AH Ashworth of Leeds. A bronze medal was given to each member of the choir. They had performed “Daybreak” (Eaton Faning) and “The Sea Hath its Pearls” (Pinsuti), and were awarded 112 marks. Other choirs competing included groups from Folkstone, Reedyford, Harrogate, Portsmouth, London, Golcar, Tonbridge and Watford. 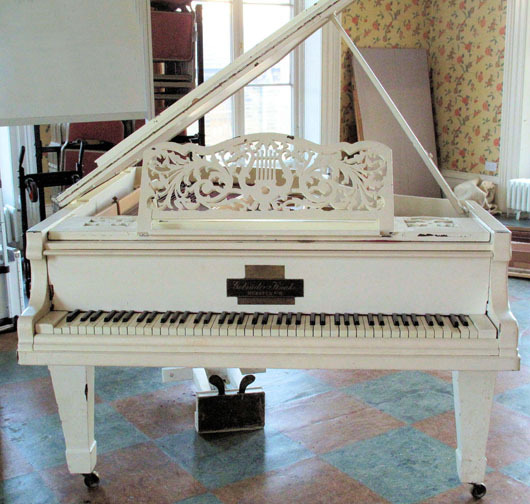 For many years this piano has been in storage, dismantled and un-tuned, at the back of the Harmonium and Reed Organ Museum which was located in Victoria Hall. When the Museum closed, it remained behind timber and equipment at the back of the Fluke Room, but this has recently been cleared revealing the piano. Discussions are currently taking place to decide its future. Re-tuning will be expensive and its placement will need to be carefully considered. However, it remains testimony to Saltaire’s excellence on the national scene in the Victorian era. Perhaps visitors to this website might like to offer suggestions for its future, and funding to re-tune and refurbish it to its former glory. Photographs courtesy and copyright of Ian Watson.